Fishing has continued to be excellent on fly in the lakes and rivers. Bait fishing in the lakes has been good and trollers are picking up some nice ones too. Rivers:- Are fishing very well at present and while not all fish are huge there are enough smaller fish feeding to have some fun and the possibilty of a better brown is very real. Hopper patterns have been working well in many areas and the evening rise has been good when the weather has been warm. Bushy's Emerger has been a good fly to try on dark and some anglers have found them to a be good searching dry during the day too. 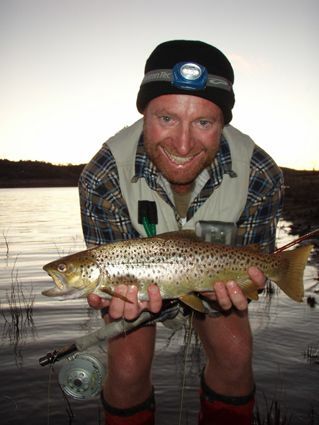 Lake Eucumbene:- Fly reports have been fantatsic on the whole. Not all anglers are catching them with regularity, and if you fish the same point or bay day after day without catching much you are your own worst enemy. It cannot be stressed enough that you need to find the fish. Covering as much water by boat or foot as you are able can be essential to catching numbers. Search out drop offs adjacent to what were the grassy bays and soaks when the water was higher. Cover as much water with your flies as possible and you will increase your catch rate. When you find a spot that is getting you hits and fish, then is the time to work the same area over hard. There should be a few more mudeyes moving during the evenings this week with the moon starting to rise later and later each night. There are bound to be some mudeyes moving and the fish should clue in on them quickly. After dark with a Taihape Tickler or similar pattern should work, but you can also try cubits mudeyes, cordulids and the ever popular hivis mudeye. Black muddler minnows are also great fish takers after dark. 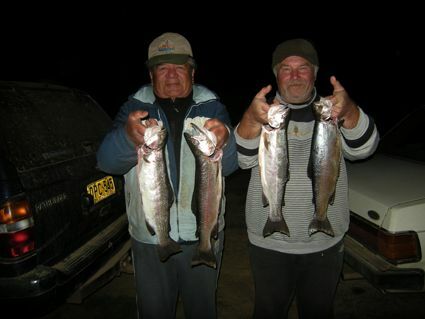 *Ken Cain from Berridale had a great session on Friday night hooking 13 fish and landing ten. He kept a couple and the fish were full of mudeyes. After dark was the best time. *Kieran O'Shannassy from Canberra got into a few over the weekend in the Seven Gates area. Muddler Poodles were a good pattern and while the fish were not thick at the time there was enough activity to keep him busy till the early hours of the morning. *Stuart Sturgeon and myself had a session on the lake on Friday evening with some daytime rainbows to 51cm and one brown. Stuart landed five, myself four and we both dropped a couple. We had a couple of fish on after dark but the activity slowed as the night progressed. Eucumbene:- Eucumbene trolling reports have been quiet with no reports this week. Would love to here from a few trollers as to what has been happening. *The two Johns, Pene and Nowak had a good session in the Middilingbank arm last night in some excellent conditions.